Bulgaria has become a bit of a revelation to us, it was down as a transit country – it was here or Albania and this looked easiest. Now we are here we are counting ourselves lucky that it was ‘in the way’ of our route, this is for us a seriously under-estimated destination. Whenever we have said we are going via Bulgaria people looked shocked and asked why, we were warned it wasn’t a good place to visit, it was poor, it was dangerous and the Roma were a real problem. We agree its very poor, other than that its totally amazing. The countryside is a mix of very green farmland, mountains and rolling hills, the people are as friendly as anywhere we have been, we have yet to drive past a horse and cart and not be waved at, the Roma have not bothered us in anyway and without exception when we speak to people they respond with a smile. For us the worst thing about Bulgaria is they shake their heads to mean yes and nod for no – no matter how hard you try its nearly impossible to to do this whilst using the appropriate words. Driving from Harmanli to Boyanovo we took the country route and in an hour saw only three cars but at least five horses and carts. Then we had the experience of joining the main TIR route from Turkey – it’s worse than anything we could imagine – potholes do not describe the state of the road. 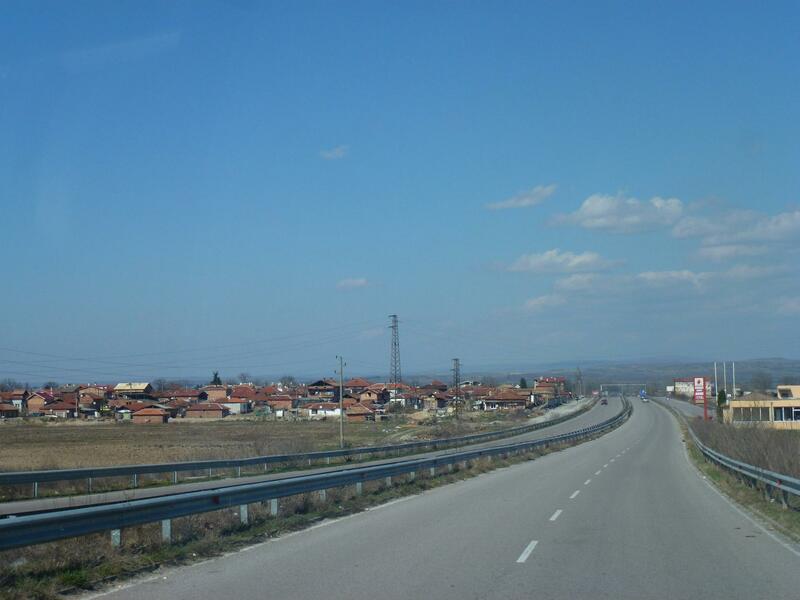 At Elhovo, the ring road was such a shocker, we had been advised to avoid it and drive through town instead. The trucks didn’t have that option though and we watched them crawl along the ring road, at less than 5 miles an hour in places. Everywhere we have been there were empty and derelict factories, when the Russians left they took the money that kept these Soviet owned businesses running, its gives an understanding as to why there isn’t any money to fix the roads when there isn’t any work to start with. We stopped off for a couple of nights in Boyanovo, at a brilliant little campsite called Gemmagos right in the village. 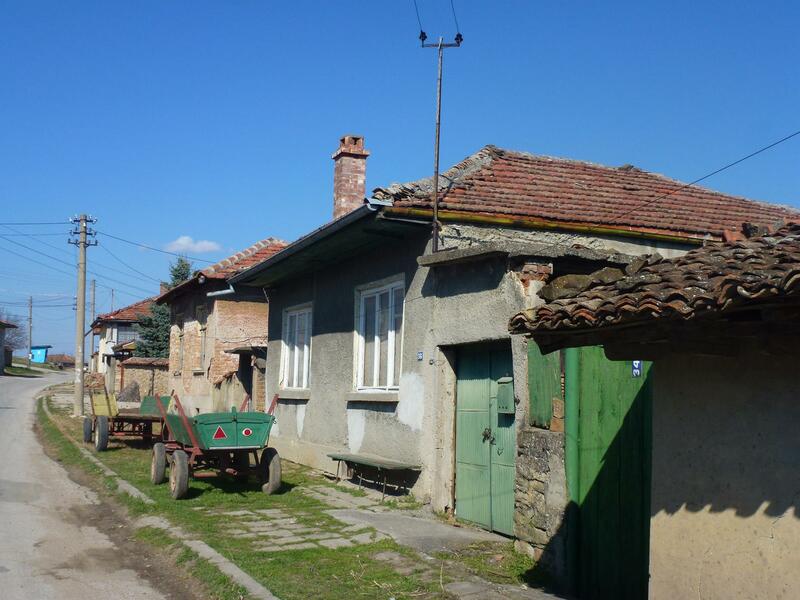 As with much of Bulgaria the village is very old, very poor and really does seem like stepping back in time with cobbled streets and outside loos. The housing was once of good quality with most property having very large gardens, many still in use for growing vegetables; keeping chickens, sheep and even a few cows in some. Dotted around the town are several derelict apartment blocks on which demolition has stopped midway, these were where many of the 10,600 Russian troops who were stationed at Boyanovo military base on the edge of the village lived before the Russians headed home. If and when they get around to completing the demolition then the village will be an attractive place again. Many of the houses and some apartments in the centre of the village were also semi-derelict but they were inhabited and the lack of windows, doors and in some cases walls seemed to be something they accept as a way of life, some of the poorer people have no choice. 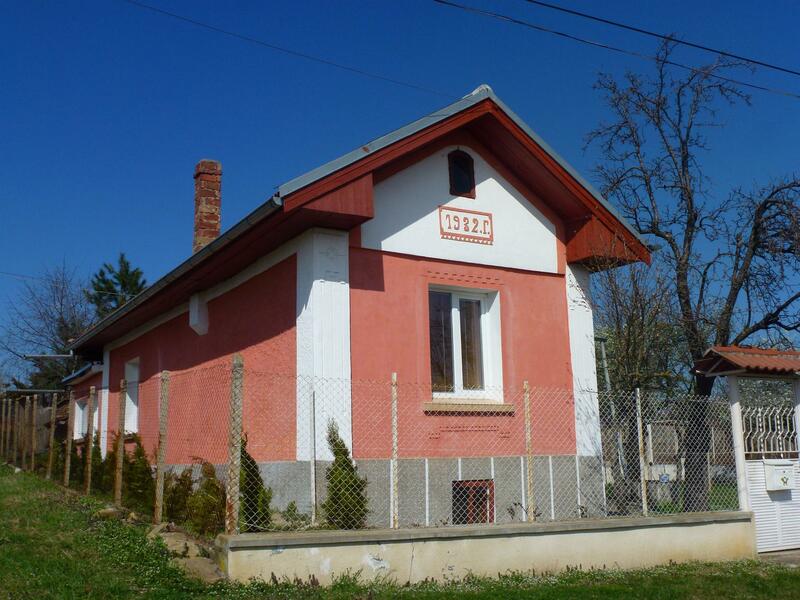 As with much of Southern Bulgaria even the better housing was in need of either a little of an awful lot of repair and renovation, the obvious exceptions were those owned by the ex-pat community. Again in a small town of less than 800 residents there were over 100 Brits in town, it was easy to spot where they live as the houses are well renovated and the massive satellite dishes really give them away. 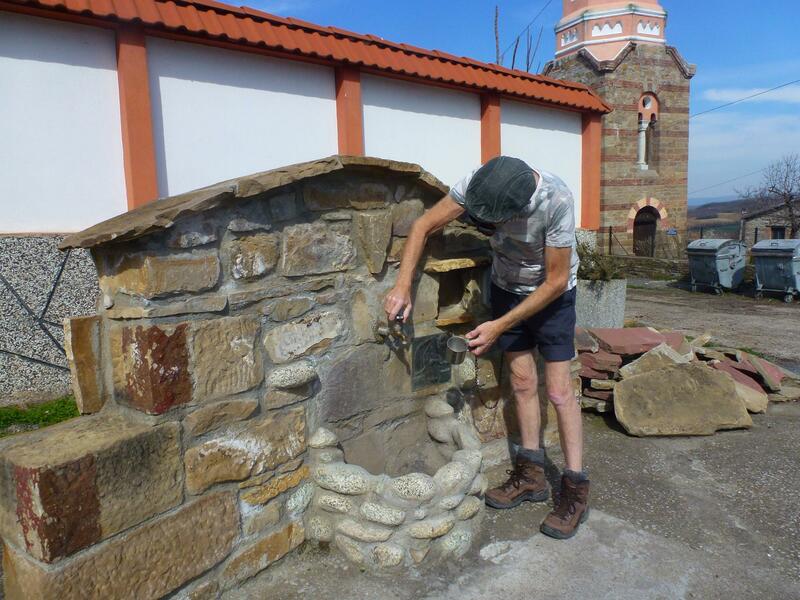 For the local Bulgarians there is very little work, as we walked through town a young Roma lad approached us and asked if he could work on our house – he assumed we must be the latest to buy a house there. Many of the Bulgarians prefer the freedoms they have now but the older generations miss the Soviet control which gave them security of work, money, food etc. However, there doesn’t seem to be any resentment towards the high numbers of ex-pats moving into the villages and towns, really the opposite as they bring money and work. We were told we could pick up a Trabant for a couple of hundred LEV – that’s around £80 (Iain is not keen on towing one around for the next 7 months though). As we had gotten used to the abject poverty in Southern Bulgarian then as we moved North towards Veliko Tarnovo things changed slightly. The villages were not quite as poor, plenty of young and old men standing around with not much too do but everywhere seemed a bit more hopeful. Without a doubt the fact that spring had sprung played a major part. As we drove through Sliven the sun came out, clouds disappeared and temperatures rose, lucky for us then as we were heading over the mountains. There was a little snow left but in general it was clear, a good road for a motorhome and very beautiful. The mountain pass was probably in better condition than many of the main roads, hardly another vehicle around, except for a couple of trucks and several horses carrying logs, in over 35 km. As we neared our campsite we came across a road closure, always a pain as we really had no idea where we were so what route to take instead. Deciding the best plan was to wave down a car and use my multi-language arm waving skills, we do and a lady slowed and wound down her window. It is the best feeling ever when you say a bit too loudly and slowly “can we use this road” and the reply is “no it’s closed, but do follow us” in a very well spoken Home Counties accent! Bulgaria must have more British than they know what to do with, said very kind lady led us the 25 km to Lidl (we spend way to much time in there, we know) where we were stunned to find things were the same cost as in Greece! After a few minutes it clicked cereal that was €2.99 in Greece was LEV 2.99 here (£2.16 vs £1.11) i.e. same price different currency so our budget goes so much further here 🙂 Likewise campsites here are coming in between £5 and £7 with electric, showers, wifi etc. and to be honest the three we have used here have been three of the best sites anywhere we have been. 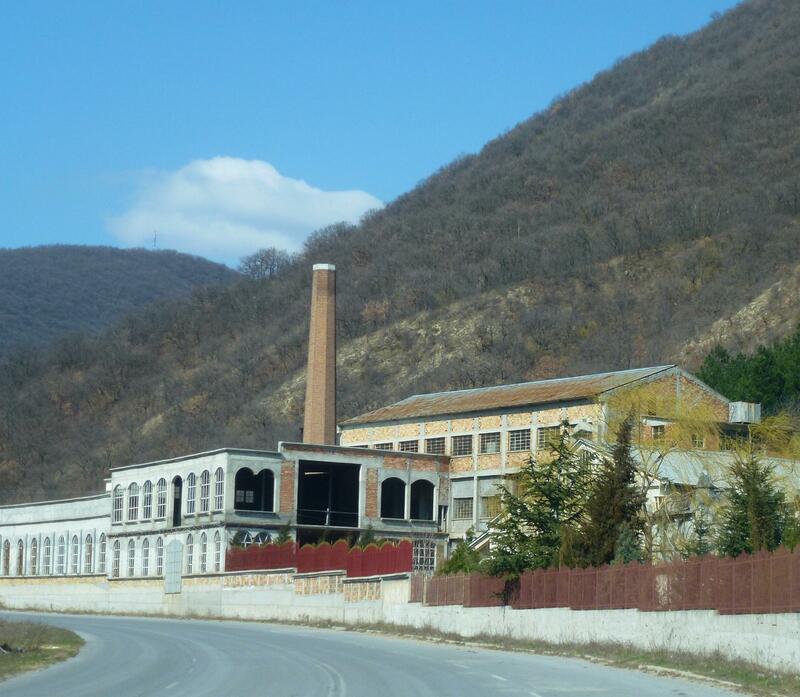 We are now in the village Dragizhevo, roughly 25 km from Veliko Tarnovo. After the poverty of the South it is certainly more prosperous here. Still plenty of horses and carts and a good few village matriarchs (known at the Baba) sitting on wooden benches outside the houses whiling away the late afternoons. 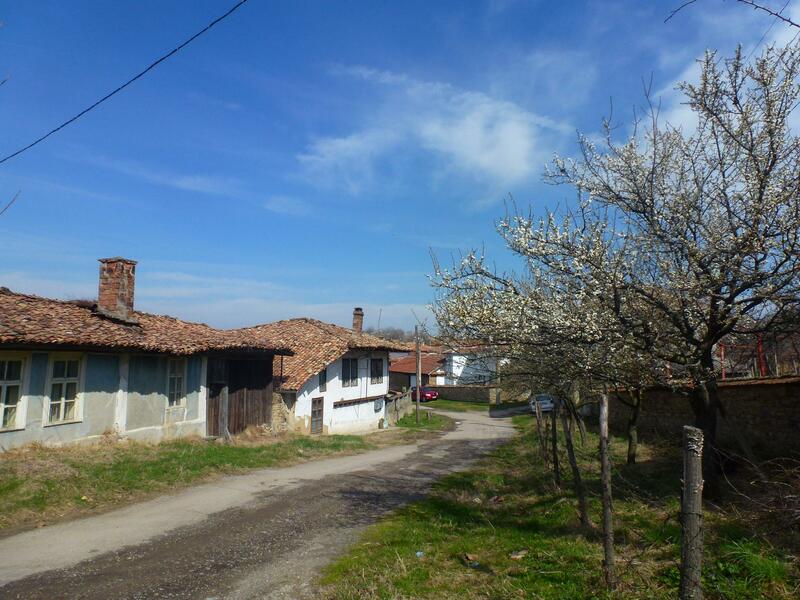 The village is known as ‘the Cherry Village’ due to it producing the first crops in Bulgaria, and they say the best. 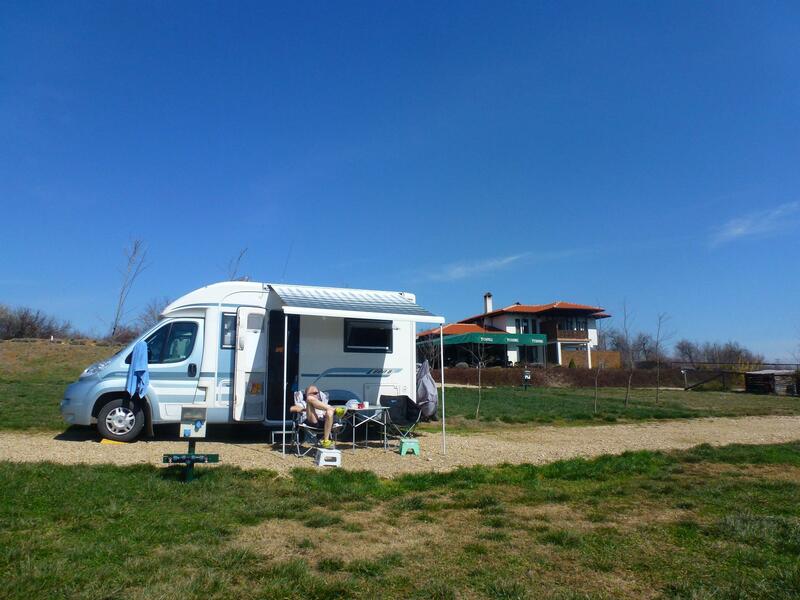 Camping Veliko Tarnovo is at the end of the village and overlooks the mountains, its just us on the site – the campsite doesn’t officially open for another week or so. We had emailed the lovely couple who own the site, Nick and Nicky (yup more Brits), who said of course we can stay, they have put on the electric and opened the showers so we are being totally spoiled again with top class facilities and not a soul to share them with. 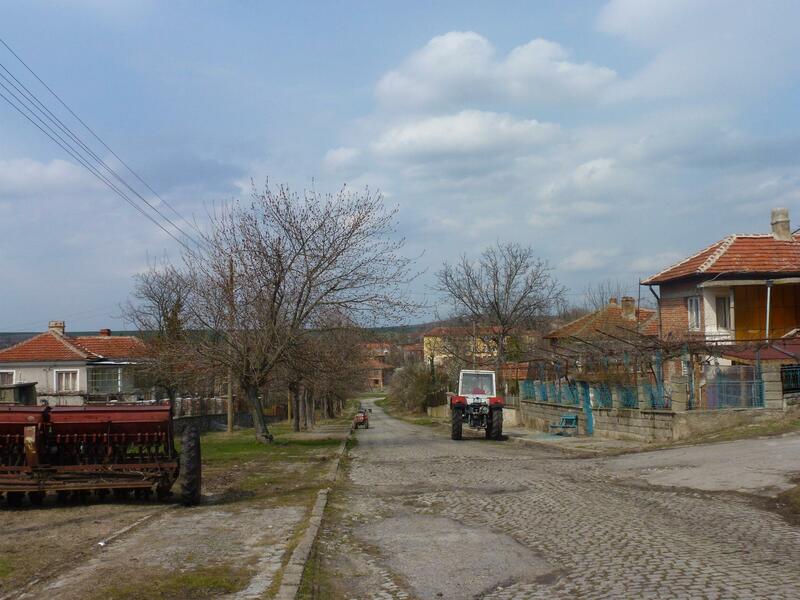 Dragizhevo village – who needs a car? First thing Monday morning and the recovery vehicle and mechanic were with us, diagnosed a ‘kaput’ battery. After jump starting us the mechanic lead us to a battery garage where the diagnosis was confirmed, the battery we wanted wasn’t in stock so they lent us another one until the next day – service above and beyond as always in Greece. 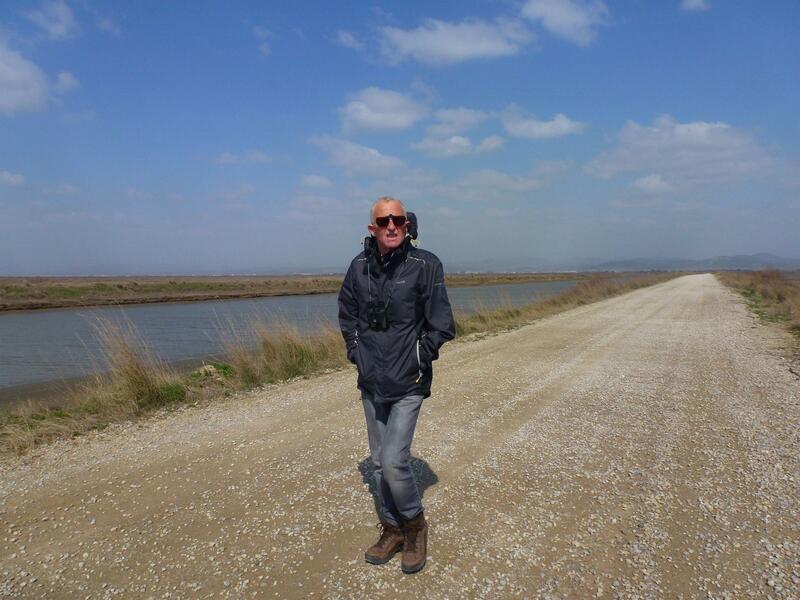 The extra day meant we could visit the Evros Delta wetlands for a bit of bird spotting. Free to enter and even ok to take the motorhome in on many of the roads. We did to the first car-park but the pot holes could have stopped a tank, we parked up and walked along the lagoon in the sunshine but holy moly was it windy, walking back after a couple of miles was like walking into a hurricane. The weirdest thing there is that every so often there are military towers dotted around due to the sensitive nature of the border – a case of watching those Turks don’t come sneaking along camouflaged as storks maybe? Just outside the Delta was another thermal spa, whilst the big complex was all closed up the spring water doesn’t recognise holiday seasons and was flowing outside. 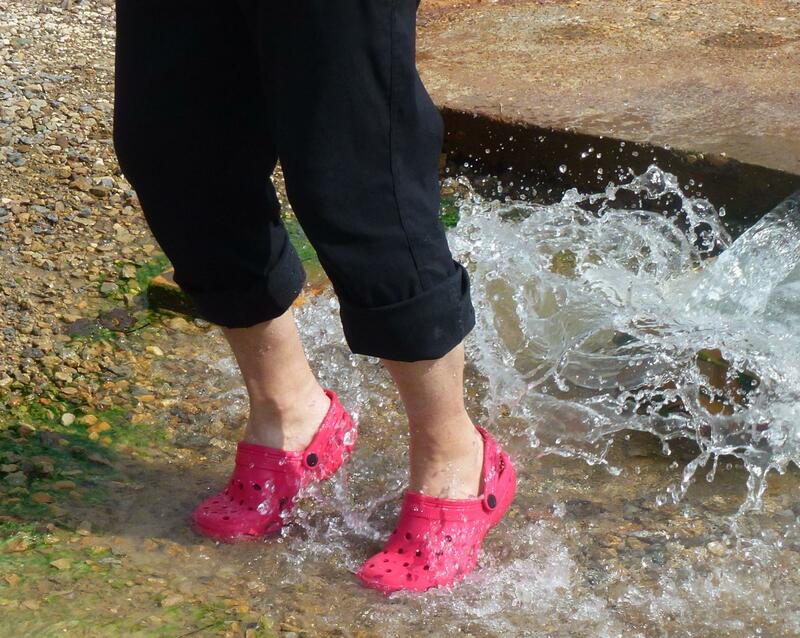 The water is so hot it burns, no exaggeration I could not keep my feet in there for more than a couple of seconds – when we checked later the water comes out at 51-52 degrees Celsius (123.8 – 125.6 Fahrenheit) that is what you call very hot. One of those place you go, burn your feet and leave fairly quickly – glad we didn’t pay for the privilege but worth a 10 minute visit for sure. Despite Bulgaria being directly above Greece finding it was never going to be easy if you are us. Our first detour occurred when the driver and Sat Nav disagreed with the navigator and took the road signed Turkey, believing there would be a turn off for Bulgaria! I was confident this wasn’t the road we needed, our arrival at the actual Turkish border confirmed my thoughts. We pulled up behind 20 odd trucks in the Customs lane just a few yards from crossing into Turkey, so we did a swift U Turn, smiled our best “sorry we are British and a bit lost” and headed away from the baffled queue of trucks and officials. 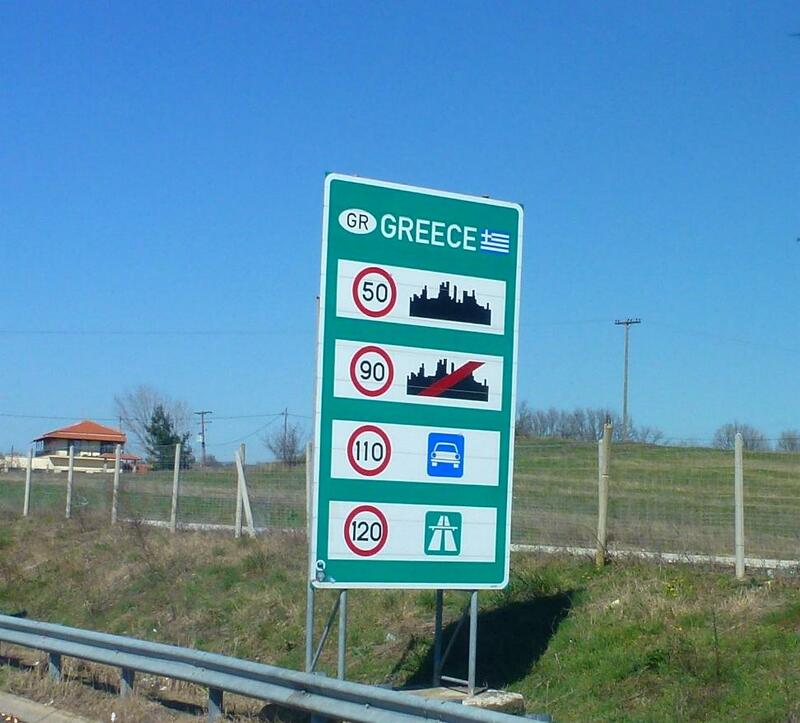 This meant we have arrived in Greece twice – this time we managed to take a photo of the border sign (we missed that on the way into Patras as 3 o’clock in the morning). Back on the right road and straight to the border, we showed a very sullen Customs man our passports and we were through. We pulled straight over in the car park just past border control, patted ourselves on the back and congratulated each other on making it as far as Bulgaria. We both got out of the van, took our first photos of Bulgaria and made our first lunch in our latest new country. After which Iain popped in the shop to ask if they sold the vignettes we needed for the roads – the answer was “no you need to be in Bulgaria to buy them”. Bugga, that was Greek Customs to leave the country but we were still actually in Greece! It was still well over a mile to the Bulgarian border so celebrations had taken place slightly too early. So its back in the van and two miles down the road, and Bulgaria takes a major credit for having proper looking borders. Lots of signs saying Bulgaria, the first Customs point has signs saying “this is a video controlled border”, which disappointed us – but a bit further up is a real border with a control man in a proper old fashioned booth looking tough and ready to stop us. We pulled in, smiled weakly and offered passports, he scanned them briefly and waved us through Border control, this time we had arrived in Bulgaria 🙂 The Bulgarian border guard was much happier than his Greek counterpart, enough to even teach me my first Bulgarian words when asked, we thought it was going to be a bit dour and Eastern Bloc – first impressions not at all. We need a vignette to drive on Bulgarian state roads – that means pretty much any road that isn’t a track or village lane. They sell them for a week, month or year, we plumped for a month as its only about £10, there was a shop selling them just over the border so we bought ours and then popped into the currency exchange shops for some LEVS. This is what border crossing is about, a tough guard, some rough old roads, buildings that look like they were put up in a hurry 100 years ago, a tax as soon as you get over the border and a wad of big foreign notes in your purse. The only thing missing was a passport stamp but the Bulgarian border still gets our vote for being the most border like border we have crossed. 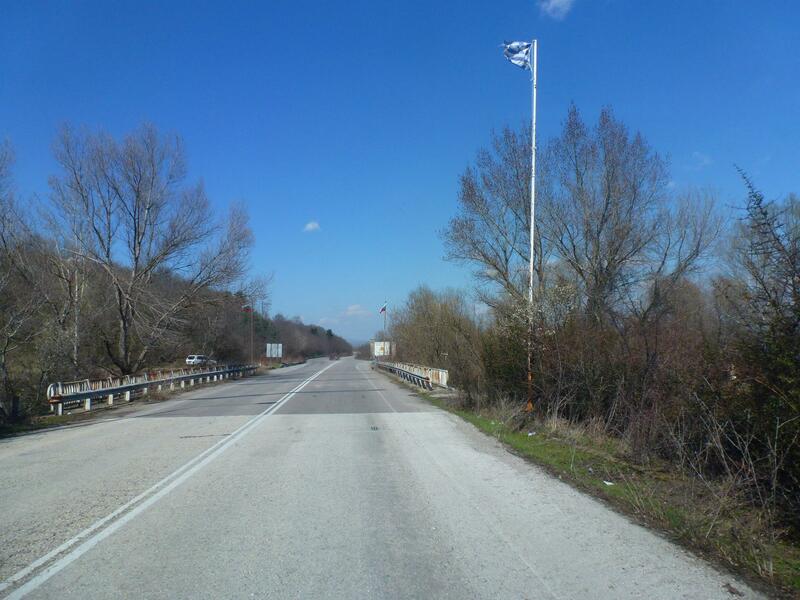 Bulgaria – yes there are roads! Bulgaria then, yes it is very different to Greece. It might be only a few miles but they make a massive difference. The first towns we came through pretty much resembled Beirut to us (no we have never been there but if we had they would). The roads come in two grades – brand new or horrendous, there are potholes you could seriously lose a small smart car in. 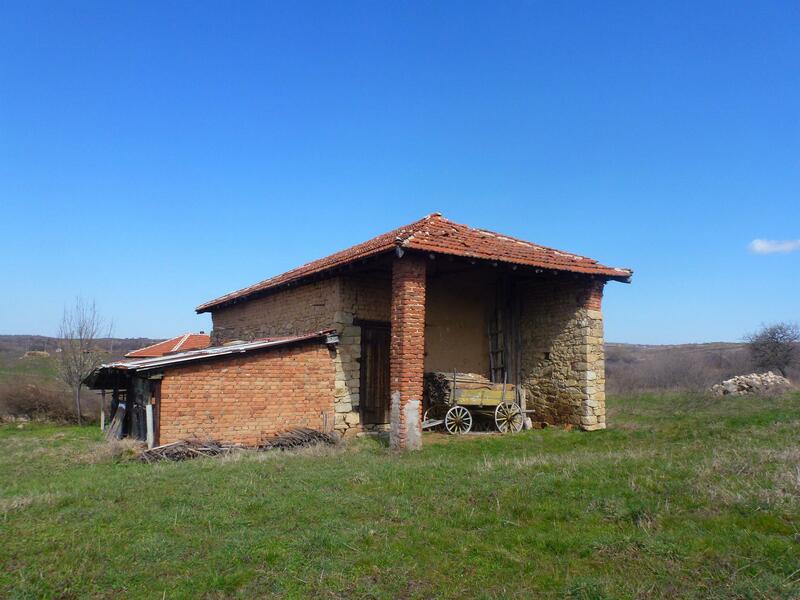 This is a poor country and it shows, houses are built then left at the bare brick look, the sheer number of ancient Lada cars confirm that no-one is splashing a lot of cash around here. In the first couple of miles we passed several gypsies on horse and carts, the Roma’s don’t live in caravans here, they just live where-ever there are empty buildings. It doesn’t feel at all threatening, it does feel like another planet from Greece though. 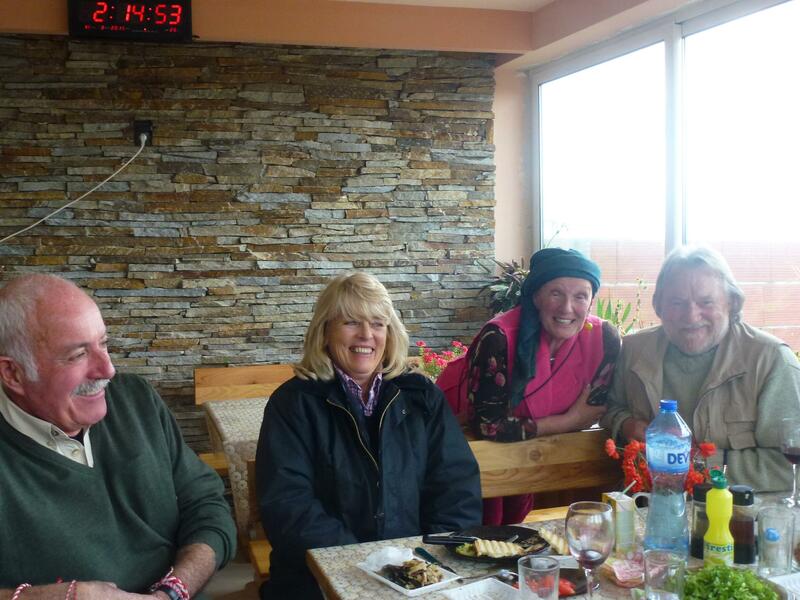 We are staying with Martin and Shirley Jeffes at their beautiful home in a village in the hills above Harmanli. They own the Sakar Hills Campsite at Biser but as its currently still closed for the season they kindly offered us the use of their drive to park the motorhome, electric plug in and use the showers and loos in the house for a few days. The Jeffes drove through on a holiday 10 years ago, parked up in the village over-night, stayed 2 weeks and before they left had bought a house. Its not uncommon, there are several Dutch and British couples in this tiddly village and many more in the surrounding area. The average house price in the villages is £3000 – so its easy to see with the climate and cheap prices why so many Ex-Pats are in this region. 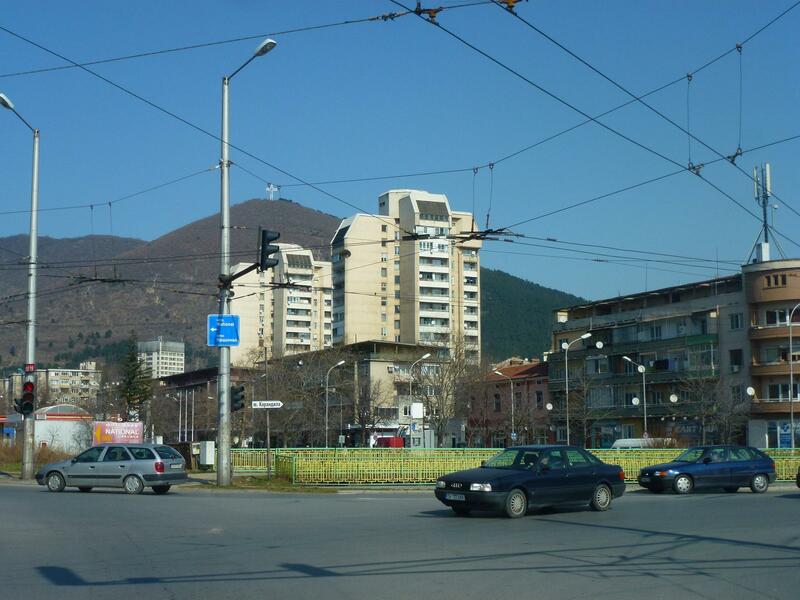 The Bulgarians are happy with incomers buying property, if not it falls to ruin and villages are slowly becoming deserted as the young people move to the cities or abroad. For the last two days we have been truly spoiled, supper and wine last night followed by lunch out today. 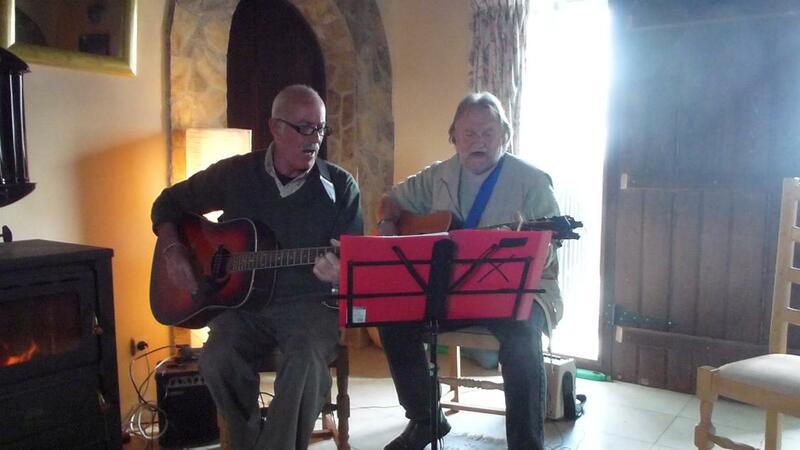 Martin and Shirley, along with Eifion and Yvonne (originally from the Valleys) treated us in the village restaurant. Its safe to say Bulgaria probably isn’t a haunt of the true foody, far from it. On offer was fish (one literally exploded over Shirley as it has been over microwaved), meatball and tripe soup (the bowl was microwaved but the soup poured in after so hot bowl stone cold soup) or kebabs on toast. None of it appeared too apertising but in for a penny I had the tripe and meatball soup, not on a first choice list for the future :(. At the end of the meal the owners brought out their home-brew Raki for sampling – seriously rough, like sandpapering your throat and then some. Lunch for six, with wine, a total of just under £10 – it is seriously cheap to live in the part of Bulgaria.